Recently, there have been a few attacks with a supply chain infection, such as Shadowpad being implanted in many of Netsarang’s products, affecting millions of people. You may have the most up to date cyber security software, but when the software you are trusting to keep you protected gets infected there is a problem. A backdoor, inserted into legitimate code by a third party with malicious intent, leads to millions of people being hacked and their information stolen. Using Intezer Analyze™, we were able to verify the shared code between the backdoor implanted in CCleaner and earlier APT17 samples. The photo below is the result of uploading the CCBkdr module to Intezer Analyze™, where the results show there is an overlap in code. With our technology, we can compare code to a huge database of malicious and trusted software — that’s how we can prove that this code has never been seen before in any other software. A deeper analysis leads us to the functions shown below. The code in question is a unique implementation of base64 only previously seen in APT17 and not in any public repository, which makes a strong case about attribution to the same threat actor. This code connection is huge news. APT17, also known as Operation Aurora, is one of the most sophisticated cyber attacks ever conducted and they specialize in supply chain attacks. In this case, they probably were able to hack CCleaner’s build server in order to plant this malware. Operation Aurora started in 2009 and to see the same threat actor still active in 2017 could possibly mean there are many other supply chain attacks by the same group that we are not aware of. The previous attacks are attributed to a Chinese group called PLA Unit 61398. A technical analysis was posted by Talos here (http://blog.talosintelligence.com/2017/09/avast-distributes-malware.html). After the embedded code is decrypted and executed, the next step is a PE (portable executable) file loader. A PE file loader basically emulates the process of what happens when you load an executable file on Windows. 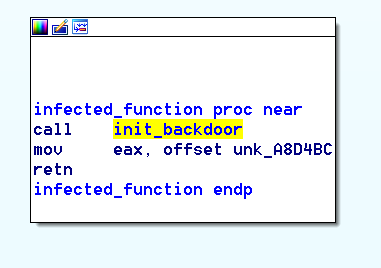 Data is read from the PE header, from a module created by the malware author. The PE loader first begins by resolving the addresses of imports commonly used by loaders and calling them. GetProcAddress to get the addresses of external necessary functions, LoadLibraryA to load necessary modules into memory and get the address of the location of the module in memory, VirtualAlloc to create memory for somewhere to copy the memory, and in some cases, when not implemented, and memcpy to copy the buffer to the newly allocated memory region. After the module is copied to memory, to load it properly, the proper loading procedure is executed. The relocation table is read to adjust the module to the base address of the allocated memory region, the import table is read, the necessary libraries are loaded, and the import address table is filled with the correct addresses of the imports. 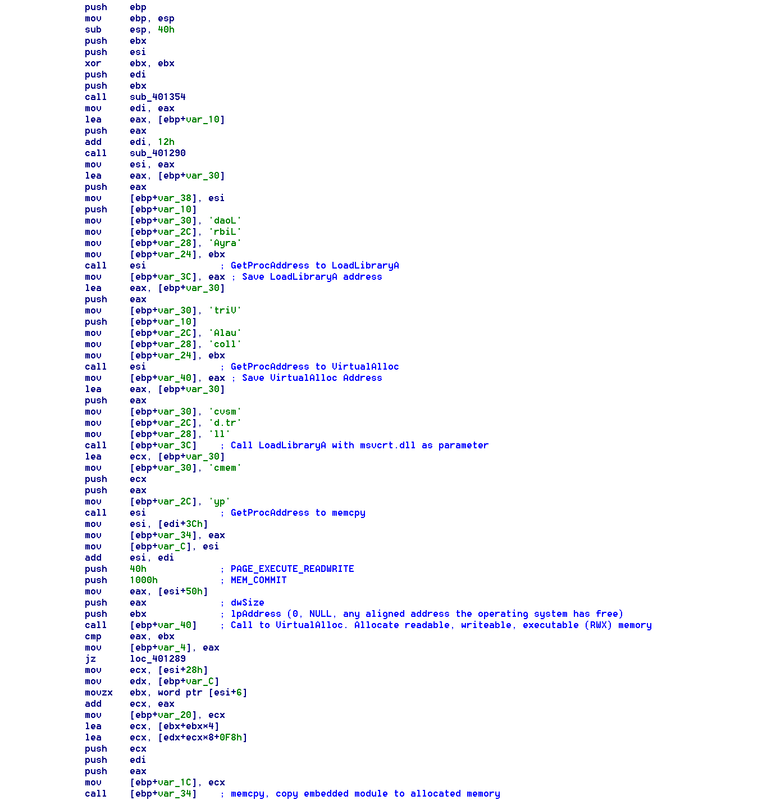 Next, the entire PE header is overwritten with 0’s, a mechanism to destroy the PE header tricking security software into not realizing this module is malicious, and after the malicious code begins execution. By the time of the analysis, we were unable to get our hands on the code sent by the C&Cs. 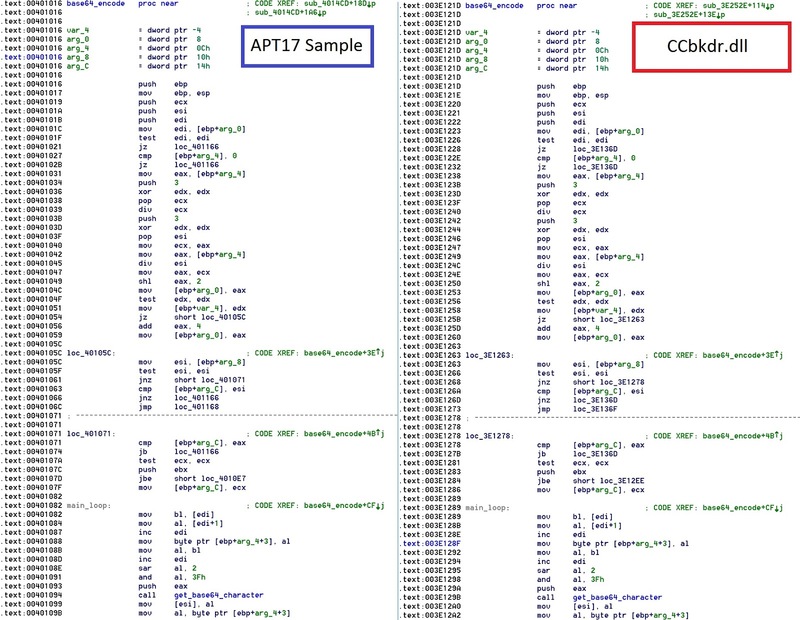 If you would like to analyze the malware yourself, you may refer to my tweet.